A few weeks ago, I wrote a post on how to save big money on travel. One of the recommendations was to take advantage of public transportation options when available. Public transportation can save you time and money, but navigating trains and buses in an unfamiliar city can be intimidating. If you do some research before you travel, you can alleviate much of the anxiety and save some big bucks during your trip. I have been riding the Metro in Washington, DC for 15 years, much of that time as a daily commuter. 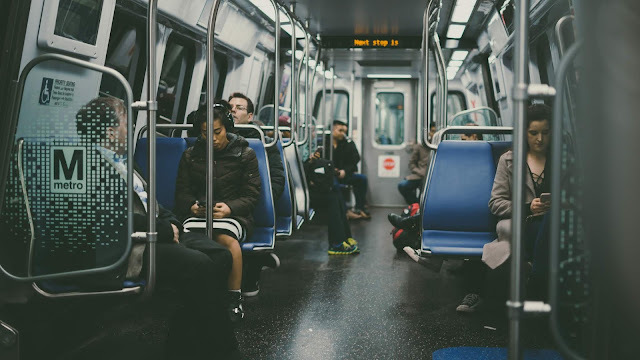 In this post, I will tell you how to ride the Washington DC Metro like a local. Note: Metro refers to the rail system that services Washington, DC and its suburbs. There are other public transportation options, including bus service, which I will discuss briefly at the end of this post. Metro operates six lines traveling through 91 stations. On the Metro map, these lines are color-coded. There is a saturation of stations in the downtown area which makes the trains a great way to maneuver in and around the city. Any rail line will take you within walking distance of popular monuments and attractions, like the Smithsonian museums, the White House and the Capital One Arena, to name a few. Metro used to be one of the cleanest, most efficient systems in the country. Unfortunately, years of maintenance neglect have worn the equipment down. The Washington Metropolitan Area Transit Authority (WMATA) which runs Metro recently began to address these issues. The result is frequent track and station closures. Service interruptions are typically scheduled on weekends to lessen the impact on commuters, but they can happen during the week. WMATA provides advance notice when tracks and stations are scheduled to close. You should check the WMATA website to find out what closures are taking place during your visit. There are 91 stations in the Metro system. Many of these stations serve multiple lines, especially downtown. Finding a station and determining which line it serves is easy. Look for the vertical marker, like the one in the picture below. 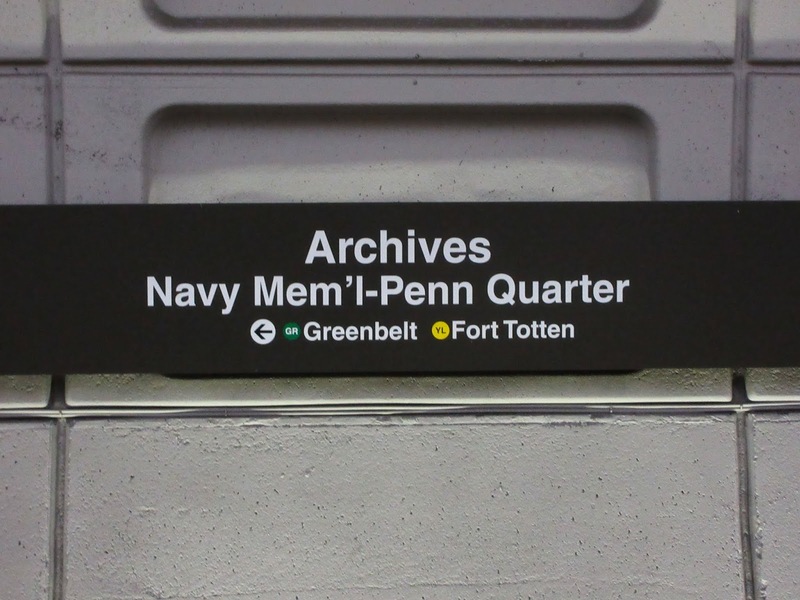 The marker provides the name of the station and the colored band(s) at the top display which lines run through the station. Metro fares are pay-as-you-go. This means that fares vary and are calculated by how far and what time of day you travel. The time of day is significant because fares are higher during peak hours. Peak hours occur from opening until 9:30 am and between 3:00 pm and 7:00 pm on weekdays. For night owls, peak hours also occur from midnight until the system closes on Friday and Saturday. Sound confusing? It’s not in practice. 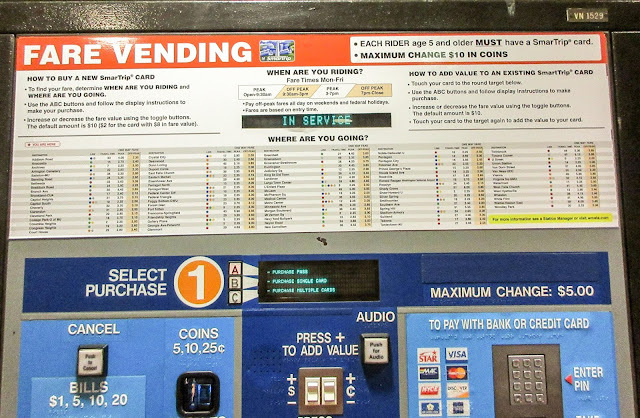 Each station displays signs on the farecard vending machines that show how much it costs to travel between stations. You can also calculate the Metro fare beforehand by using Trip Planner on the WMATA website. You will need a SmarTrip card to ride Metro. Cash and paper farecards are no longer accepted in the system. SmarTrip cards are plastic, reloadable farecards. You can buy one at any station. If you want to get one before going to the station, they are available at many retail locations, including Giant (supermarket), CVS and Walmart. They are also available online. 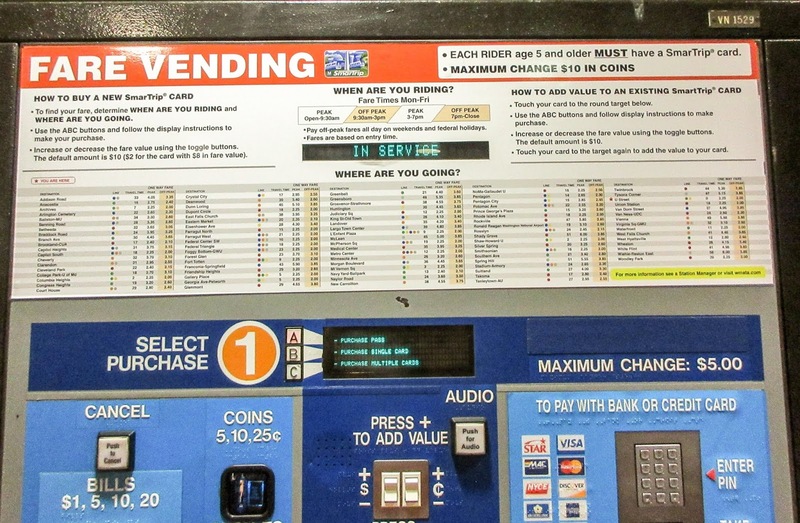 Unless you are visiting during a major event, it is easiest to buy a SmarTrip card from the vending machines at the station. The card costs $2, but you will pay $10 to buy one because they are sold with $8 of value already loaded. Metro offers several passes for visitors. A one or seven-day pass may save money, but it depends on your plans. You should do some research and calculations to determine if a pass is a better option than a SmarTrip card. In general, the further from downtown you are staying and/or the more you need to get on and off Metro, the more sense purchasing a pass makes. Visit the WMATA website to learn more about passes. Once you have your SmarTrip card loaded, it is time to get on the train. There will be a fare gate near the vending machines. Tap your card on the round target at the top of the gate, and the doors will automatically open. Put your fare card in a place where you can get to it easily because you will need it again to exit the station. That’s right. You need to tap your card twice, once when you enter the station and again to exit when you arrive at your destination. 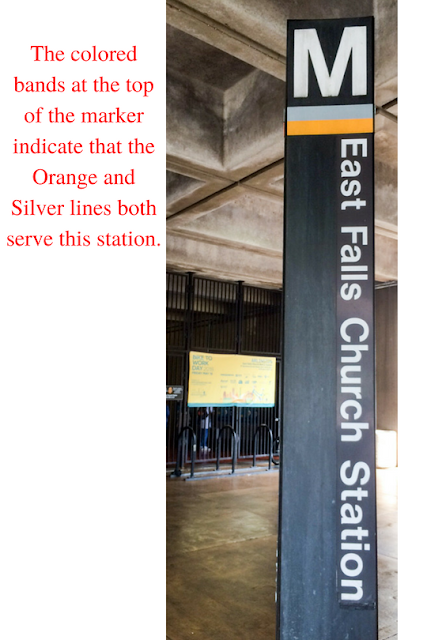 You made it through the fare gate, but how do you know which way to go? Metro has excellent signage that displays the last stop for trains that run on that line and the stops in order until the end of the line. At stations where tracks run in the center with the platform on either side, these signs are near the escalators to reach the platforms. At stations where the tracks run along the outer wall, the signs are available on the platform. If you can’t figure out how to find the fare, buy a SmarTrip card or which train to hop on, no worries. Each station is manned by at least one Metro employee during operating hours. They are helpful and will point you in the right direction. Red: This U-shaped line runs through the northern part of the city and the Maryland suburbs of Bethesda and Silver Spring. Main stations are: Union Station, Metro Center, Chinatown, Dupont Circle, Woodley Park (Zoo). Blue: This line runs east-west through Maryland and the District, then drops south in Virginia. The Blue, Orange, and Silver lines share the same track between Rosslyn in the west and Stadium-Armory in the east. This means that you can ride any of these lines while traveling in the downtown area. 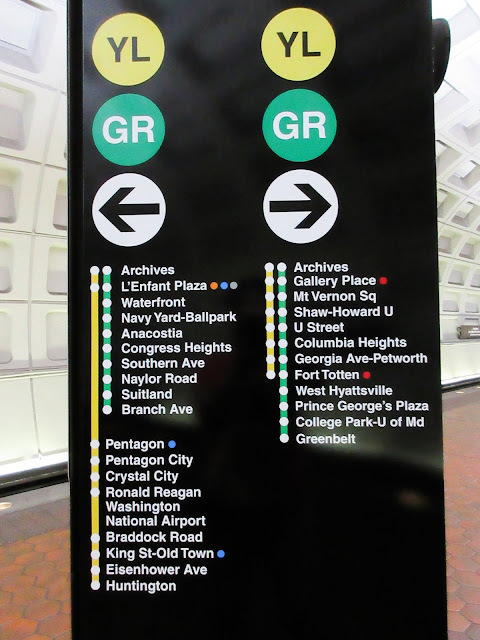 Main stations are: Capitol South, Smithsonian, McPherson Square (White House), Arlington National Cemetery, Pentagon, National Airport, King St-Old Town (Alexandria). Orange: This line runs east-west from Virginia, through the city and into Maryland. The orange line shares the track with the Blue and Silver lines downtown, but pay attention to the color you are riding if you leave downtown. 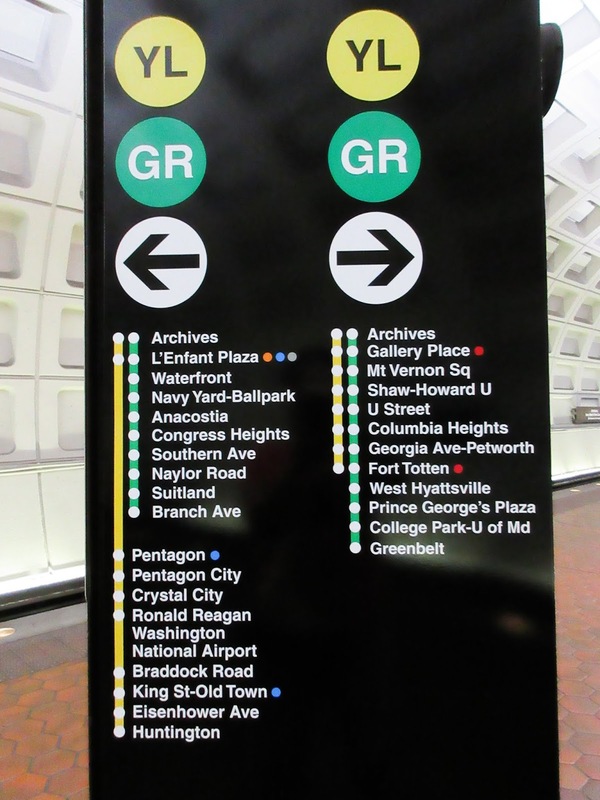 Main stations are: Capitol South, Smithsonian, McPherson Square (White House), Clarendon. Silver: Metro’s newest line runs east-west from Virginia, through the city and into Maryland. Eventually, this line will take passengers to Dulles Airport. For now, you can take a bus to the airport from the Wiehle-Reston East station. Main stations are: same as the Orange line, plus Wiehle-Reston East (Dulles Airport) and Tysons Corner (large, upscale mall). Green: This line runs north-south on the east side of the city and through parts of Prince Georges County. There is a bus that runs from the Greenbelt Station to BWI Airport. 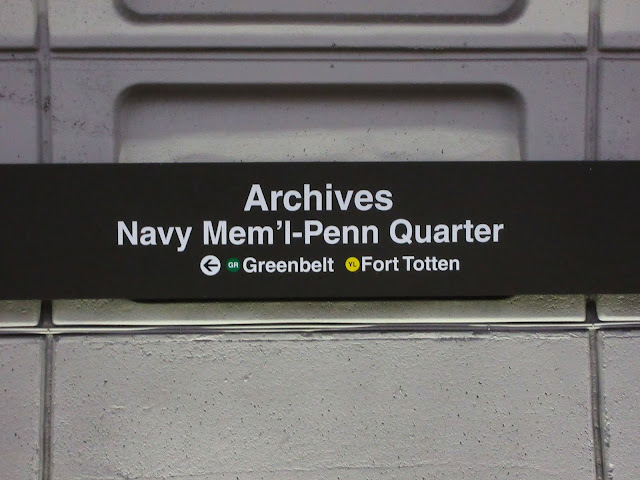 Main stations are: Navy Yard-Ballpark (Nats Stadium), L’Enfant Plaza, Gallery Place, U Street, College Park-University of Maryland. Yellow: This line runs north-south and parallels the Green or Blue line. The Yellow line is a more direct route between downtown and the southern stations in Virginia. Use it to travel to National Airport from downtown. Main Stations are: mostly the same as the Green and Blue lines. Metro is a convenient way to travel around Washington, DC and the suburbs. If you still are not comfortable riding Metro or it does not service areas where you travel, no worries. Trains are only one piece of Washington, DC’s extensive public transportation system. Here are some other options that will help move you around DC during your visit. Metrobus runs 325 bus routes in DC, Maryland, and Virginia. If you are staying in the outer suburbs, there may be a bus route near you. 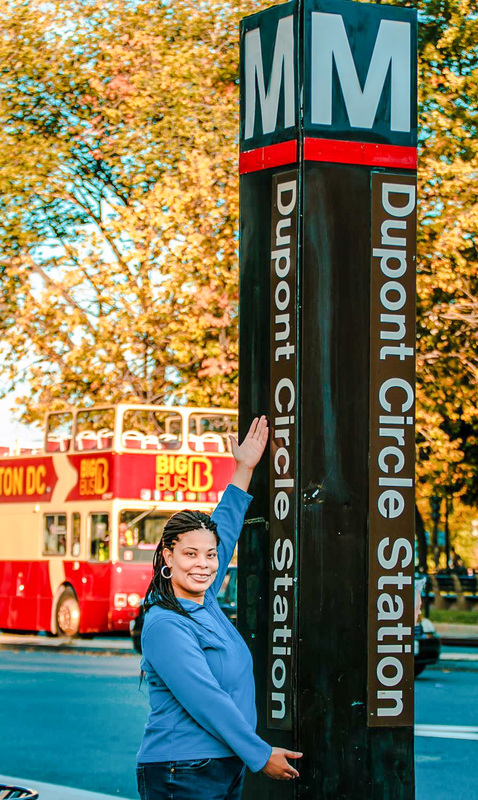 Circulator Bus, operated by the DC Department of Transportation, provides bus service to popular neighborhoods like Georgetown and Adams Morgan. ART and Fairfax Connector operate bus service between Metro stations in the Virginia suburbs and surrounding neighborhoods. Capital Bikeshare is an option if you are not into trains or buses. Rent a bike at one of the many kiosks in the DC area. Lyft and Uber, the popular rideshare services, are available day and night. Finally, DC is a walkable city. Many times it is easier to stroll between neighborhoods than catch a train or bus. Have questions about using public transportation to travel in the DC Metro area? Ask them in the comments. Hi! I’m Linda, a New York native who calls Washington D.C. home. Linda Dee Travels is where I share my personal travel stories and advice on how to travel as a solo woman on a budget. Come and join me on my travel adventures around the globe.